The 7,800 sq. ft. Jamaica Estate is Only 5 Miles to Strip! We Do Not Support Party Houses. The Jamaica Estate sits on a half-acre of private land in a private gated community. With more than plenty of room with 7,800 sq. ft. to offer, this home is three stories with rooms on each floor. All the furniture in the home is very high-end, with many pieces we have collected from our travels around the world. As you enter the property you will be greeted by a beautiful waterfall in the courtyard. The Master Bedroom on the top floor is nearly 1000 sq. ft. and is very private and luxurious with a spa like bathroom and a balcony overlooking the Las Vegas Strip. On the bottom floor sits a pool table, TV and a mini kitchenette with 3 bedrooms and 3 bathrooms. You can also walk out to the pool from this level. The mid-level of the home has two additional bedrooms and 3 bathrooms. The office is also on this level and can have a mattress put in upon request, making it a 7-bedroom home. The gourmet style kitchen has all top of the line heavy duty appliances with an 8 top buffet bar style seating, all the dishes and cook ware you will need to prepare a great home cooked meal. Should you need or like to treat yourself to a private Chef, we can most definitely have it arranged for you as well. Everything you will need, shops, clubs, pubs, groceries, Wal-Mart, banking, gas stations, you name it, is less than a half mile from the home. The Las Vegas Strip is a short drive, one straight road at only 4.5 miles! So come and pamper yourself in this one of a kind lavish estate fit for a King and his Queen. Property was better than advertised. We had a great time. Property is in the perfect location to alll that Las Vegas has to offer. The home was ready and very cleaner when we arrived. Host was on point and very attentive. We will be staying again! We really enjoy our stay! The house was big enough for our needs. The owner was responsive and helpful. Just a really nice stay. Thank you for the great hospitality! It was a pleasure to have you. We sincerely appreciate you taking such good care of the home and following all of the rules and regulations. Thank you for going the extra mile and cleaning both the inside and outside as well as you did, very much appreciated. House was perfectly described and worked out great for us. Our family of 16 stayed at this lovely home for Thanksgiving week. The children & adults all loved the hot tub...& as a family of musicians we thoroughly enjoyed our sing alongs with the beautiful grand piano. There were some plumbing issues that were quickly taken care of, thankfully, on Thanksgiving Day. Richard & Brenda were very accommodating & were also very easy to work with. We were only about 5 minutes from the strip, which was nice & convenient...& just moments from grocery stores & shopping. Overall we had a great stay & hope to return again sometime soon! We are pleased that you and your guest had a wonderful stay! We want to further thank you for leaving the home in clean condition and following all the rules & regulations while in the home. You can never predict when situations will arise, we did take care of the plumbing just as quick as possible. We want to thank you so much for being so understanding during this time. We look forward to having you back soon. This place had almost everything we needed! The living room/kitchen was great as well as the outside space. Make sure if you need the spare bed in the office, be aware that it is a twin bed, not a full bed. And it was just on the floor. The king bed down stairs was a little uncomfortable, but nothing too out of the ordinary. Definitely would reserve this property again. We had 10 people and all were comfortable in the house. Thanks! Yes the extra mattress is by special request only. We do set it up in the office for you when you may have that additional guest. It is pretty comfy and we make it up real nice with new linens and blankets. There is also a bathroom right there so it is kinda like your own little spot. Our hats off to all our team members, that pull it all together to make each guest feel at home. The home was just as beautiful in person as it is in the pictures! The home adequately accomodated my group of 12. We really enjoyed all areas of this spacious mansion. The pool area was perfect for entertaining and we enjoyed using the grill for cooking. This was a gorgeous space to enjoy my 40th birthday celebration with friends and family. We DO NOT support "Party Houses" Email now for specials & exact quotes All rates are subject to change without notice, NO Price is guaranteed until contracts have been fulfilled Prices may be higher during conventions holidays special events and weekends summer 50% down,balance paid 60 days prior to arrival. 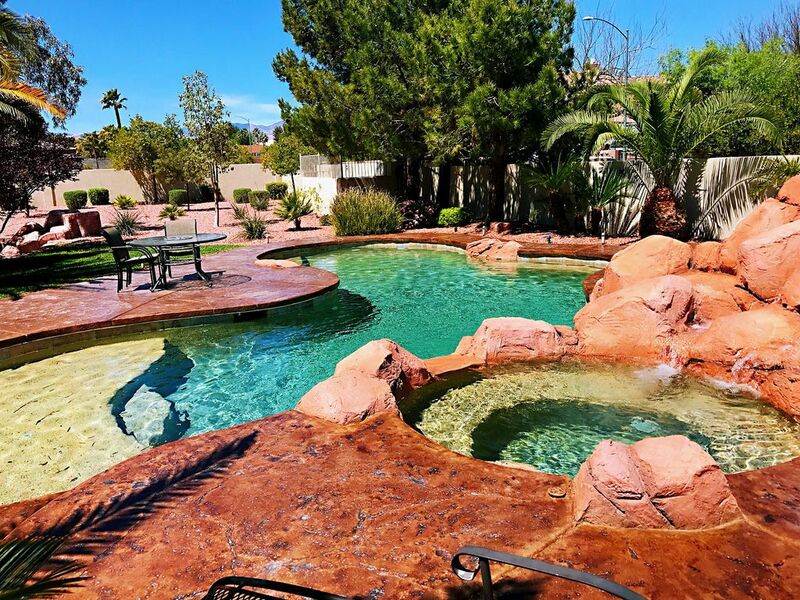 Pool & Jacuzzi heat optional for nominal fee must be ordered 3 days prior to check in.